Today’s Final Jeopardy answer (in the category 19th Century Inventors) and statistics for the Friday, February 15, 2019 game between Mark Smith, Amanda Holm, and 4-day champion Eric R. Backes. Today’s Final Jeopardy answer (in the category Colorful Geography) and statistics for the Thursday, February 14, 2019 game between Mitch Rodricks, Alex Miller Murphy, and 3-day champion Eric R. Backes. Today’s Final Jeopardy answer (in the category Poets) and statistics for the Wednesday, February 13, 2019 game between Seth Birnbaum, Susie Highley, and 2-day champion Eric R. Backes. 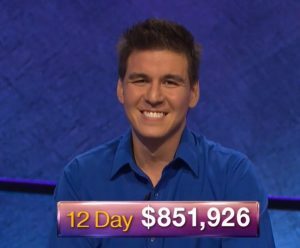 Today’s Final Jeopardy answer (in the category Islands) and statistics for the Tuesday, February 12, 2019 game between Ellen Clark, Rob Williams, and 1-day champion Eric R. Backes.